Carters Barn is a beautiful mid terrace bright, spacious, barn conversion with original oak beam features, furnished to compliment the stunning rural countryside setting. In the heart of the Dorset countryside this cottage is ideally located to explore all the attractions in the stunning county of Dorset and the immediate surrounding Isle of Purbeck. Newly refurbished with an open plan ground floor, the property features a country kitchen with seating area opening out via a stable door to a spacious back garden. A bright spacious living area leads to a secluded front garden via French doors and a cosy lounge area with a feature fireplace adjoins the kitchen. There are two large bedrooms, one double one twin or super king. The main bedroom overlooks the stunning grounds with floor to ceiling windows. The upstairs bathroom features a bath and overhead shower. 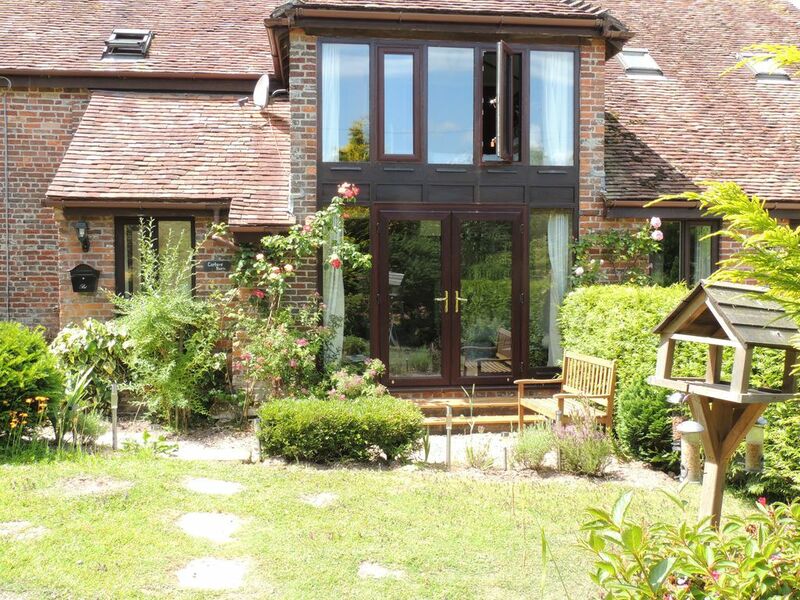 Adjacent to the property is a plant nursery and a wildlife pond with a small woodland. Wireless for emails and web browsing only. iPod dock. No landline telephone available. Central heating. Video tour available on request. Passionate about wildlife, rock climbing, wildfowl and the purbecks. Beautiful location. Rural yet close to local towns and villages. Abundance of wildlife and close proximity to the Jurassic coast and all the adventures it offers including rock climbing. Upstairs bathroom serves both bedrooms and features bath/shower, sink and WC. For web browsing and emails only. The living room consists of seating for 4. Flat screen TV with built in free view, and external DVD Player. TV can be plugged into laptop or USB devices. Living room features French doors leading out to secluded front garden with seating area. Private front and back garden. Outside: Seating for 4 people in the enclosed rear garden. Large open front garden. Towels / Linen: Towels and linen are included and are changed weekly. Other: The lounge adjoining the kitchen consists of seating for 2/4 in front of feature fireplace (electric). Good location only a few miles from Lulworth Cove. The cottage is spacious & light & very much feels like a home from home. Zoe's instructions were very useful & everything is laid out so you can find it easily. Can't recommend the cottage highly enough & if I stay in Dorset I'll definitely look to stay here again. This is our 2nd visit to Carters Barn. It is a very comfortable, homely place and has everything you need. Lots of attractions within a short drive and a couple of good pubs about a mile walk. Thank you, it was lovely to host you both again. I hope you return soon. We have stayed at the barn twice now and intend to be back as we feel so at home here! The barn is spotlessly clean, very comfortable and has everything you need. It is in a quiet location with pretty surroundings. There are a couple of pubs about a mile away and plenty of attractions within easy driving distance. Thank you for your kind words, I look forward to welcoming you both back soon! everything, all the personal touches, made you feel at home instantly. A relaxing peaceful location looking out over the gardens. We came to visit Monkey World for the weekend, which was a short drive from the Barn so we couldn't have picked a better location. It was a pleasure renting the Barn from Zoe, she was extremely helpful and made you feel welcome from the very start,. Thank you again Zoe, you made my 50th Birthday very special! Thank you so much for such a kind review and for being wonderful guests. I do hope you can return in the future. Beautiful well-appointed property. Peaceful, with easy access to iconic landmarks. Fantastic week of autumn half term fun with the lovely barn to come home to and cosy up in the evenings. Very enjoyable stay at Carter's Barn and would recommend it. Cosy and well appointed cottage, lovely garden, felt at home as soon as I walked in and the little touches from Zoe, the owner, make the difference. Location is good and within striking distance of Lulworth Cove, Durdle Door, Corfe Castle, etc. It really does feel like a home from home. Minor gripes would be - I think it would benefit from wifi as the mobile phone signal is very poor but, on the plus side, it was nice to escape from technology. The freeview TV was also a bit hit and miss but, again, this is probably more to do with its location and poor signal and, again, is a minor point. Overall, I would - and already have - recommended Carters Barn to friends. Thank you for your kind review and I am so pleased you had a lovely week. There is actually WiFi at the barn, apologies if it wasn't easy to locate. I really hope to welcome you back in the future! 4 miles (12 minutes drive) to Lulworth Cove. 15 miles (30 minutes drive) to Studland Beach and Nature Reserve. Monkey World, the Tank Museum, Winfrith Heath, Corfe Castle and Lulworth Castle. Many National Trust properties and RSPB reserves are within driving distance. Wareham, Wool, Dorchester, Lulworth Cove, Durdle Door. Swanage, Sandbanks and Weymouth all feature beautiful sandy beaches and are within 30-45 minutes driving distance. Great for rock climbing at Swanage or Portland. Booking Notes: Bookings are secured with a 25% deposit (non refundable), outstanding payments to be made within 14 days before arrival. Payments by bank transfer or credit/debit card. Changeover Day: Changeover day is Saturday, Arrivals after 15:00pm, departures strictly by 10:00am please. Notes on prices: Weekly lets run from Saturday to Saturday, Short Breaks from 3 nights.